Heaven's Throne Room is an area in Heaven where God sat before he left. It was first mentioned by Joshua while explaining how people perceive different things when they witness the Garden which lies at the center of Heaven, including the throne room. It appears to be where God goes to hear the prayers from every person on the planet. Joshua, as he talks to Sam and Dean in the Garden of Heaven, briefly mentions how people see God's Throne Room when they envision it. 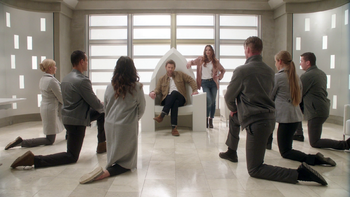 In the throne room, the angels all kneel before Lucifer as he takes pride in his new position as the leader of Heaven with Sister Jo by his side. Lucifer is seen struggling with his role as the leader of the angels, so he decides to listen in on humankind's prayers. He chooses to focus on two priests attempting to exorcise a demon. After his attempts to help humanity fail, Lucifer returns to the throne room where he declares his intent to locate his son to recreate the world in his image. This provokes Jo to chastise Lucifer, who prepares to kill Jo, before releasing her and letting her leave the throne room. Jack sits in Heaven's Throne Room to receive prayers. Upon gaining entry to Heaven, Castiel finds himself in the empty throne room before the arrival of Dumah and two other angels. Castiel lays out his dilemma and asks for Dumah's help. Castiel waits in the throne room for an indeterminate amount of time before Dumah returns alongside Naomi. 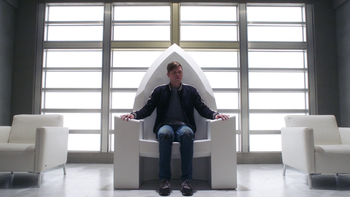 After successfully manipulating Jack Kline for her own ends, Dumah has him sit in the throne as she attempts to keep Castiel from interfering. As Castiel confronts Dumah, Jack receives a prayer from Sam asking for him to return home. Jack departs Heaven as Castiel kills Dumah for threatening John and Mary Winchester's souls and races to the throne room to find him gone. God's Throne is a ceremonial chair referenced in Judaism, Christianity, and Islam where God resides. The throne is located beyond the Seventh Heaven, the highest division of Heaven. This page was last edited on 21 April 2019, at 06:22.